Why Are We Susceptible to Late-Night Food Cravings? I used to wonder if opening the fridge at night and peering around was an abnormal habit of mine, or maybe even a muscle-memory thing. Googling “Why do I get hungry at night?” reveals that I’m not alone: Variations of that same question appear to have been asked on every internet forum known to mankind. Like most things, the phenomenon can be explained by science. Your genetic makeup also can lead to midnight munchies. In 2014, scientists discovered a pair of genes, PER1 and PER2, that normally keep eating and sleep habits in sync. When a mutation is present in PER1, however, all-powerful night-time cravings descend upon us. In tests, scientists observed mice with a mutated PER1 gene waking up and seeking out food when they should’ve been fast asleep. That doesn’t necessarily mean that mutation carriers will feast uncontrollably at night, though. According to the Salk Institute for Biological Studies’ newswire, “When [the] team restricted access to food, providing it only at the mice’s normal meal times, they found that even with a genetic mutation in PER1, mice could maintain a normal weight.” In other words, maybe limit your access to late-night food stashes (and taco carts). 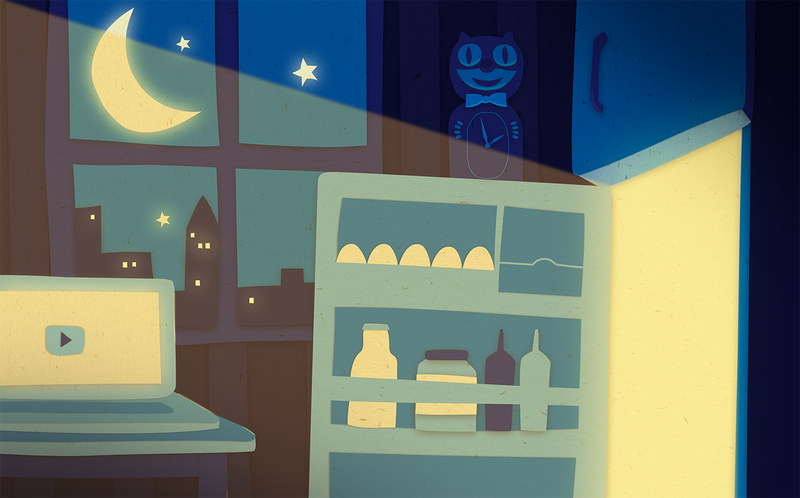 Rest assured that it’s not just you — night-time cravings are a universal experience. And they don’t necessarily mean bad things for your health. It’s okay to indulge at night, so long as you maintain healthy eating habits during the day. An easy way to keep yourself in check is to allot a small handful of calories to consume before bedtime. Snacks like Nature Valley Granola Cups — whole-grain oat granola cups filled with peanut butter and dipped in chocolatey goodness — make for an ideal night-time indulgence: They’re sweet, crunchy, and only 200 calories per serving (for two whole cups, y’all). Reason to never go to bed hungry — or in a food coma — again.